Bush Smarts STORM TARP by Bush Smarts at Mountain Walk. MPN: 1storm tarp. Hurry! Limited time offer. Offer valid only while supplies last. 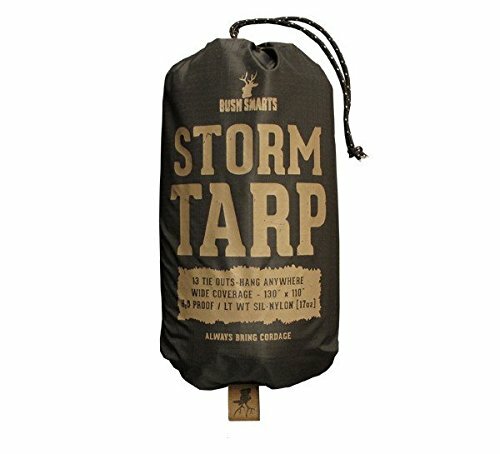 The Bush Smarts Storm Tarp is the ideal size for a small group shelter or to beef up your hammock when all H-E-Double Hockey Sticks breaks loose. The Bush Smarts Storm Tarp is the ideal size for a small group shelter or to beef up your hammock when all H-E-Double Hockey Sticks breaks loose. With flexibility in mind, we added 13 anchor loops around the edge and top - so you can make anywhere, home. We don't seal the seams in our shop, but we have seam sealer if you need it-add to cart in the drop down below. Cordage not included but we sell that too. Storm Tarp plays exceptionally well with Grizzlies. If you have any questions about this product by Bush Smarts, contact us by completing and submitting the form below. If you are looking for a specif part number, please include it with your message.